This March 25th marks Flannery O’Connor’s 94th birthday and if you’re near Savannah, Georgia, Flannery O’Connor’s birth place, you could join the Flannery O’Connor enthusiasts who line up each year in Lafayette Square for the Annual Flannery O’Connor Birthday Parade. They dress up as their favorite O’Connor characters and take part in this street fair. 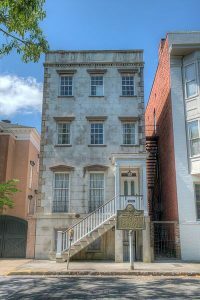 Meanwhile across the state in her hometown of Milledgeville, Georgia, Flannery O’Connor’s alma mater, Georgia College and State University, has recently undertaken the significant investment to renovate and restore Andalusia, Flannery O’Connor’s home and farm. At first glance, this devotion to an author whose writing life was rather short, and whose production was rather small, might seem strange. Flannery O’Connor was only thirty-nine years old when she died of lupus in 1964. During her lifetime, she published two novels, and one short-story collection. Her second short story collection was published months after her death, and since then, other posthumous books have followed. As a living writer, she achieved moderate fame, even as the majority of her writing life was spent quietly on her farm. After her death, O’Connor’s fame exploded, surpassing many of her peers. She once commented, “as for biographies, there won’t be any biographies of me because … lives spent between the house and the chicken yard do not make exciting copy.” Yet she has been the subject of multiple biographies, including Brad Gooch’s bestseller, Flannery: A Life of Flannery O’Connor. And there’s no signs of this stopping any time soon. Perhaps the more impressive feat is that she has managed to find favor with such wide audiences, appealing to both academic and popular readers. According to Literary Hub, Flannery O’Connor is the fourth most anthologized author and her story, “A Good Man is Hard to Find” is tied for the fifth most anthologized short story. In 2009, to honor their 60 year anniversary, the National Book awards opened their Best of the National Book Awards Fiction award up to readers who voted in their online poll. Flannery O’Connor’s The Complete Stories was the overwhelming favorite. This broad-based appeal explains her influence on popular culture. Her impact on the landscape of writing is unprecedented with authors from Joyce Carol Oates to Alice Walker writing about her. There hundreds of books devoted or inspired by Flannery O’Connor (including my own—The Gospel According to Flannery O’Connor), but it does not stop with literature. She’s impacted actors (Tommy Lee Jones wrote his masters thesis on O’Connor at Harvard), comedians (Conan O’Brien also wrote his thesis on O’Connor at Harvard), and visual artists (see the works of Panhandle Slim). Her works and appeared in popular shows such as Lost or in popular movies such as Wild. The upcoming documentary, Flannery, has interviews with many of these contemporary writers and artists (Tommy Lee Jones, Alice Walker, and Alice McDermott). Musicians seem especially susceptible to Flannery’s influence—U2’s front man, Bono, has claimed an affinity for Flannery O’Connor, as has Bruce Springsteen, whose album Nebraska was inspired by her work, and there’s always Ministry’s “Jesus Built My Hotrod.” The list of songs and bands named after O’Connor or her characters is long, from Sufjan Stevens’ “A Good Man is Hard to Find,” Kevin Morby’s “Flannery” to the band, Weyesblood. Even the Georgia brewery Wild Heaven named a beer after O’Connor’s debut novel, Wise Blood. How is it that a writer who had such a relatively small output has had such a major impact? It’s impossible to pin down a single reason why Flannery O’Connor’s fiction has resonated with so many audiences. Flannery O’Connor may be synonymous with the Southern Gothic, but her work extends beyond its own zip code. Her fiction is dark, macabre, cryptic, and just plain fun. Flannery O’Connor once wrote that “a story really isn’t any good … unless it hangs on and expands in the mind.” O’Connor’s influence, much like her fiction, has stuck with us and seems to be continuously expanding. So this March 25th, there are many ways to appreciate Flannery O’Connor, whether you dress up as your favorite character, crack open a Wise Blood IPA, or put on that U2 album, just be sure to pick up The Complete Stories of Flannery O’Connor (and maybe listen to “Jesus Built My Hotrod”). 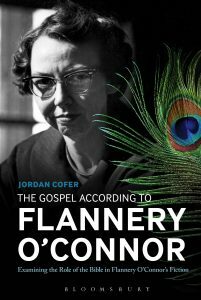 Jordan Cofer is the author of The Gospel According to Flannery O’Connor, co-author of Writing the Nation: A Concise Introduction to American Literature as well as the co-editor of forthcoming essay collection, Reconsidering Flannery O’Connor. Image used under CC BY-SA 3.0. Photo by David Dugan on Wikimedia Commons.